Of all the kinds of mass transit that have been funded by grants from Washington, rail-based rapid transit has proved the most expensive, the least traveled, and the least adaptable to the population movement that has characterized American cities over the last thirty or forty years. The Cato Institute's conclusion is simple: The Federal Government should stop funding monopolistic public transit systems and avoid major investment in fixed facilities such as tracks, which can only be used for rail transport. Instead, it should encourage cities to turn to competitive, privately owned van lines and other forms of transit that emphasize flexibility. Our mayor is big on mass transit, a good thing as far as I'm concerned. He is pushing to build a five billion dollar extension of the subway to Santa Monica. It would be great to see the red line pook out at the face of the Palasades. The way I see it, if driving is not a right but a privilege, then how can a free society permit their cities to be configured in such a way as to control the natural right for a citizen to navigate urbanism by potentially revoking their privilege to drive a motor vehicle? The City Journal article seems to conclude that subways are money pits, and the article concluded that perhaps New York's subway might be a neccessary money pit. But I'm suggesting that all cities of a certain scale might need a subway system, given our prospective future of a denser urban lfe. Who knows, maybe robots can cut the cost? I wonder how the costs break down? Hmmmm. On the other hand, perhaps it is possible to have scattered urban villages, dense pedestrian, small scale transit with automobiles navigating the wards/ cantons --intercity rail sans subway? The point of the City Journal snippet -so I understand- was that mass transit tends to be a financial boondoggle. That may or not be true, we'll see. Some traffic planners see the automobile as the ideal mass transit system. They've got an argument: point to point and on demmand, it is not to be equaled. They just think the cars should be singel user, like motorcycles or... scooters! At least if we are to have a boondoggled subway system, maybe we might as well use it... and we can't use it if we can't get to it. Some people question the expense to use ratio, and their arguments are strong only if we stay in our cars. But the city is thickening and people need to get around. The friction of higher density is going to be.... interesting. As much as we need a subway to the sea, a public rail line is only one part of a constellation of systems that should work together to move people within a metropolis. Public transit: buses, subways, intercity light rail, short distance trolleys... and private enterprise transit: taxis and... jeepneys! 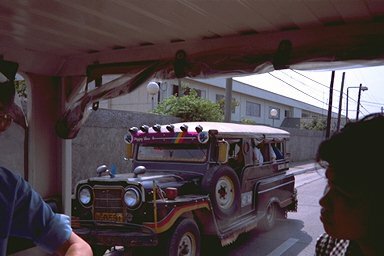 Jeepneys can fill in the bottom end, human scale end of the spectrum. Let people go after the market born of urban density's friction.